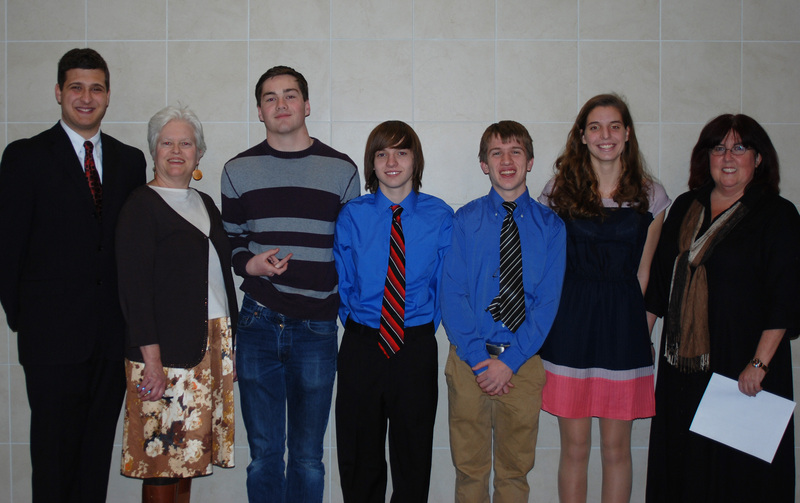 Last year’s Poetry Out Loud Contest: Chris Carchedi, Mrs. Amy Woodward, Pearse McNally, P. J. Butler, Joseph Palana, Lilly Margolis and Miss Cahill. McNally and Butler will compete again this year along with eight others! On Wednesday, January 29 at 7:00 in the RHS/RMS Lecture Hall ten students from the high school with be taking part in the annual Poetry Out Loud competition. The following 10 students are reciting the listed poems. The winner of the contest will go on to the regional contest and compete against winners from other high schools. According to Mrs. Woodward, director of Rockland’s competition, this is the ninth year that the competition has been held. Judging by the high number of contestants this year, it has grown in popularity each year. Eight students competed last year and Chris Carchedi won the RHS competition. His performance at the regionals in South Yarmouth allowed him to advance in the State finals in Boston. This put RHS back in the finals for the first time since 2010. Come to the lecture hall on the 29th to see who will follow in his footsteps! Posted on January 16, 2014, in Uncategorized. Bookmark the permalink. Leave a comment.